In Search of Liberty is a dramatic-comedy film to not only entertain, but to educate young & old alike. Take a patriotic journey led by a historical colonial figure to learn the importance of the U.S. Constitution, what it means to American freedom, how it is being challenged today and what can be done to protect it. Children are often taught that government protects our life, liberty, and property, but could it be true that some laws actually allow people to hurt us and take our things? Join Ethan and Emily Tuttle as they learn about property, pirates, and plunder! Both a manual and a program, “Teaching Children the 28 Principles of Liberty” expounds upon the principles in Cleon Skousen’s book, “The 5000 Year Leap,” and lays out a program to help adults teach the principles to children. This is not just a rewrite Skousen’s book, but a manual for adults to teach children ages 8-11 these principles. The principles are not difficult to understand, but Skousen wrote his book for adults, not children. Each lesson teaches one principle per each hour-long meeting, with fun games, activities, role-plays, crafts, songs, and thoughtful, reflective discussions. 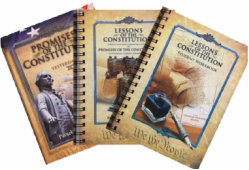 Promises of the Constitution Complete Constitution Curriculum – For Home schools, Family Study, Private Schools and in-depth Individual Study – This three book set teaches the power and brilliance of our Constitution as students read, write and discuss, with optional projects, books and extra credit. Independent study for students who read comfortably; guided study for all ages. The “In the Constitution for Youth” series was born of Jeff’s realization that his first series, “In the Constitution”, wasn’t reaching the most critical audience – America’s next generation! The principles of freedom found in the Constitution come alive as these truths are introduced in fun and engaging ways in the youth series that teach both the “what” and the “why” of freedom. Jeff is finding that Einstein’s statement, “If you can’t explain it to a six year old, you don’t understand it yourself!” has proven to be very true and very challenging. Although these presentations are geared more toward 8 – 15 year olds, they are powerfully simple and engaging for all ages. The first two presentations are complete (Pledge of Allegiance and Self-Evident Truths) and dozens more are on their way. The Stories in this book are about the rich American heritage that we share; they are meant to unify Americans so they can stand together! They can inspire us to do our part as individuals, families, and communities to read, understand, obey, and defend the U.S. Constitution. Welcome to our new study course, Proclaim Liberty Throughout all the Land. In this course you will learn the basic principles that are embodied in our founding document, The Declaration of Independence and the US Constitution. You will also become conversant with each part of the Constitution and understand, perhaps for the first time, how nearly every problem we face in America today could be easily solved by understanding and applying the wisdom of America's Founding Fathers. This student workbook is in a fill in the blank format. While teaching at BYU Dr. Skousen learned that by having students fill in key words as they go throught the material, they would be able to retain the information they read by as much as 60%. Answers are in the back of the book. Join thousands of Americans who have learned the principles of freedom found “In the Constitution”! In these 11 engaging presentations we explore the foundations of liberty and we tie them in with the actual text of the Constitution. It seems that, to one degree or another, we understand the principles of freedom upon which our country was founded, and yet, sometimes, we feel uncomfortable when it comes to tying those principles in with the actual document that serves as the supreme law of our land. That’s what the “In the Constitution” series is all about! 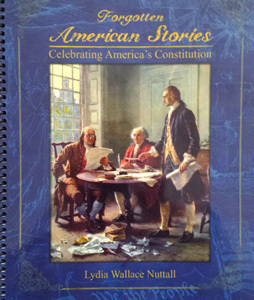 The words of the Constitution come alive as we explore the Founding Fathers’ statements on the different topics and gain insight into how the Constitution embodies those foundational principles of freedom.